Welcome to our modest clothing store! 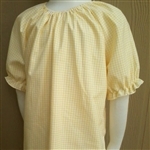 We have custom made clothing, and clothing that is in stock. For stock items, you will usually see the phrase "in stock for quick shipping", while custom items will have multiple sizes and some other options to choose from. Please email us if you have any questions. In each category on the left, you should find some of each kind. Most of the categories are futher divided into stock and custom garments. Be sure to check the Deal of the Day first to see what is on sale in your size! We also have promotional items featured here. For frequent updates to our site, including last minute sales, you can sign up for our Frequent Buyers group here. We offer free shipping on USA orders over $100!